Will audit still be relevant in the years to come and will auditors still be able to deliver added value? We asked these two questions to those who actually practice audit: our own auditors, across all grades and countries . Not only did they all reply with a resounding “yes” to both questions, but they also all agree on the need for audit to change dramatically. In a globalised world where technology is progressing at an unrivalled pace, audit practices cannot remain the same as they were twenty or thirty years ago. 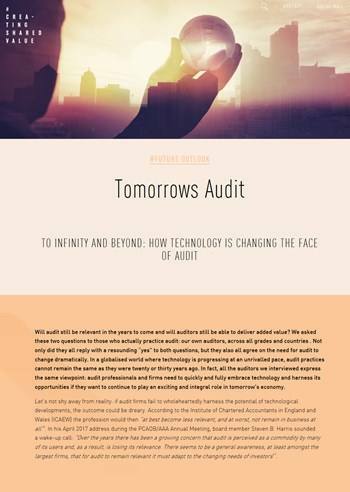 In fact, all the auditors we interviewed express the same viewpoint: audit professionals and firms need to quickly and fully embrace technology and harness its opportunities if they want to continue to play an exciting and integral role in tomorrow’s economy. Let’s not shy away from reality: if audit firms fail to wholeheartedly harness the potential of technological developments, the outcome could be dreary. According to the Institute of Chartered Accountants in England and Wales (ICAEW) the profession would then “at best become less relevant, and at worst, not remain in business at all”2. In his April 2017 address during the PCAOB/AAA Annual Meeting, board member Steven B. Harris sounded a wake-up call: “Over the years there has been a growing concern that audit is perceived as a commodity by many of its users and, as a result, is losing its relevance. There seems to be a general awareness, at least amongst the largest firms, that for audit to remain relevant it must adapt to the changing needs of investors”3.